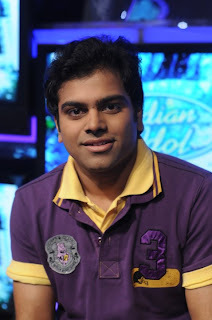 Twenty-five-year-old Sreeram Chandra from Hyderabad won the Indian Idol Season 5 music reality TV show crown here on Sunday night beating Gujarati girl Bhoomi Trivedi and Agra boy Rakesh Maini. A highly gifted versatile singer, Sreeram came to the show after having lent his voice to several Telugu movies as a playback singer. The name of the winner was announced by Bollywood mega star Amitabh Bachchan at the grand finale of the long-running popular show held at Filmistan Studio. The winner gets a Rs. 50 lakh cash prize, a car, a motorbike, a one-year contract with Sony TV and a chance to sing in one of the forthcoming movies of Yashraj Films. Amitabh Bachchan said he had been watching Indian Idol all along since the selection process months ago because his wife Jaya loves the show. “It is very difficult to satisfy her because she has very strong likes and dislikes. Since she followed this programme, I followed suit,” he quipped. Winner Sreeram has already recorded a song with Bollywood playback singer Shreya Ghoshal for an upcoming movie, music for which has been composed by Salim-Suleman. Music composer Salim Merchant is also one of the judges for the Sony TV show along with veteran music director Anu Malek and leading playback singer Sunidhi Chauhan.